Sunday is a big cooking day at Casa de la CupcakesOMG! It's when I go shopping for the next 4 days of paleo meals and do little more than stand in the kitchen and cook for 6 hours, wash my hair, and watch Drop Dead Diva. By the end of it, I'm pretty much in no mood to make an entirely separate meal to celebrate the end of a day of what should be rest. However, this Sunday, Kyle and I had company for dinner and we wanted to do something a bit more special. Perhaps inspired by our recent trip to Texas, Kyle was all aflutter at the prospect of making pulled pork, so that's what he did while I whipped up my favorite mayo-less cole slaw and a new recipe for sweet potato casserole. And of course, it was all entirely paleo. As a kid Even now, my favorite part about the sweet potato casserole at Thanksgiving was the toasted marshmallow topping. I would eat just the marshmallows and my grandmother would add more to the potatoes and toast them again because I liked them so much. So okay, we're agreed that marshmallows have about as much nutritional value as a tank of gas, which is why I subbed in a cinnamon maple pecan topping instead. Four gigantic sweet potatoes later, whipped with some coocnut milk, spices, maple syrup, and a toasted pecan topping and your new paleo-improved side dish is complete! Kyle's cousin Brooke made dessert--homemade peach ice cream made with grassfed cream, roasted peaches, egg yolks, and maple syrup. I mean, it was G.D. incredible y'all! 1. Bring a large pot of water to a boil and preheat oven to 350 degrees F. While water comes to a boil, peel and dice sweet potatoes into large chunks. 2. Add sweet potato chunks to water. Boil until fork tender--about 10 minutes. 4. In a small bowl, combine all topping ingredients until pecans are well coated. 5. 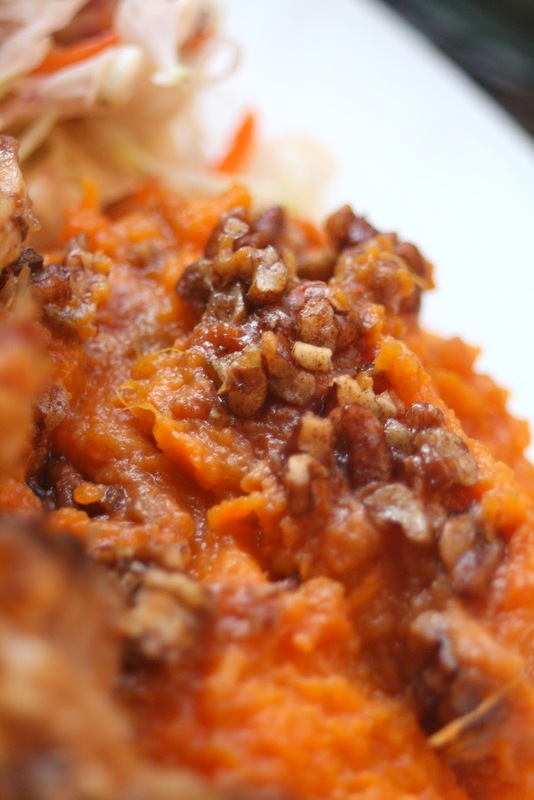 Dump sweet potatoes into an oven safe dish and top with pecans. 6. Bake in preheated oven until topping is browned--about 15 minutes. Serve warm. Can't. Stop. Drooling. Don't you want to come over and make this for me on Sunday night? No?! FINE. I'LL MAKE IT MYSELF. 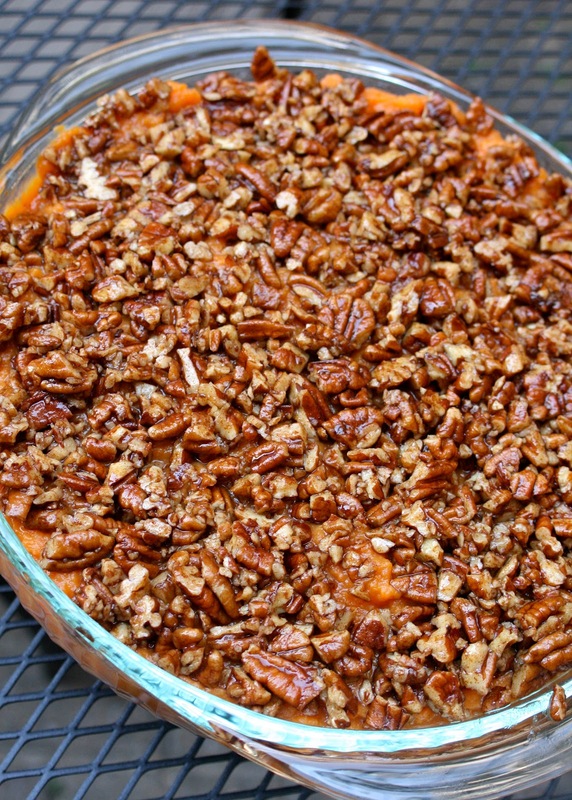 Looks looks like the sweet potato casserole my mam maw makes and I love it. I may have to do this for dinner tonight. Looks so good!! Wow looks awesome! I will have to try this soon! I have to make that, like, NOW! DAMN. Kyle is one lucky guy. This reminds me of my grandmas cooking around the holidays, mmmmm. Delicious! I'm glad you gave Gran credit for the marshmallow topping do-overs! I didn't have anything to do with that overindulgence. She also let you eat an entire jar of maraschino cherries and always encouraged you to eat dessert first so you wouldn't be too full for it after dinner! LOL! P.S. Wish I could have been there, it looks delicious! This looks SO good!!! I'm def pinning your recipe!!! OMG. Looks freakin amazing. Cannot wait to try this baby out! Ok, that looks so good and it makes me want to wish Thanksgiving was here already. this looks like heaven in a dish. I made this last night and it was SOOO good!!! It reminded me so much of pumpkin pie. It was incredibly delicious. Even my kids loved it. Thanks for sharing! Oh my!!! Both of these look fantastic! I have the sweet potato casserole in right now!!! Is there any way I can get the recipe for the ice cream???? Looks heavenly!!!! Meant to ask...do you think pastured butter would work in place of the coconut oil (I know it's not typically "paleo", but I have no issues)? @Anonymous absolutely! I have no problem with butter either--and pastured is great. Raw is even better and might as well be paleo in my opinion! Can you use almond milk in place of coconut milk? Wow! this looks awesome! :) Can you please post the icecream recipe? Just made these for Thanksgiving tomorrow! Delicious! Only suggestion is to add a pinch of salt - really brings out the flavors. Thanks for the great recipe. Made this for Thanksgiving, i loved it! i loved that they weren't super sweet, and the hint of coconut was delicious. this morning i used a cup of the leftovers + almond milk, greek yogurt, protein powder, and ice, and made a fantastic smoothie. Can you use almond milk in place of coconut milk?? Can this be made with regular milk? Not paleo, of course, but would the consistency turn out ok? Wonderful, delicious new addiction! Wow! I made this for Thanksgiving and I pretty much ate it all!! I added coconut sugar! It was absolutely delicious and definitely one of my favorites now. THank you for sharing. I made these at Thanksgiving for my meat-eating family and they cleaned their plates AND asked me to make them again for Christmas. Wow. I am impressed! First off I am soooooo glad I found your website! 9 days into paleo as of today! I freaking love Paleo! I recently mashed sweet potatoes with coconut milk, organic butter and topped it with chopped pecans. BUT your recipe makes me feel basic :)!! So thank you for giving me an idea for thanksgiving!!! It looks amazing, and I cannot wait to make this! Oh my gosh, thank you! My mother-in-law brings regular sweet potato casserole each year. She's not coming this year s I am going to sneak in your version instead of her super sugary version. Think this will reheat well if I cook ahead?